The story thus far: Dante, a poet and town prior in Florence, finds himself on a dark road of the soul. Before his spirit can fall to its ruin, he encounters Virgil, the greatest poet of classical Rome. 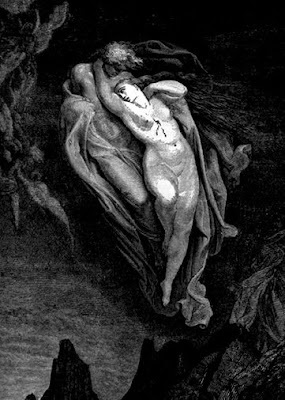 Virgil, at the behest of Beatrice, a woman who was Dante's inspiration in life, offers Dante a journey through the realms of the afterworld, through which Dante may find his soul's salvation. He shall travel through Hell, Purgatory, and Heaven, with Virgil as his guide through the first two. Dante accepts Virgil's offer, and they embark. After passing through the gates of Hell, they encounter the souls of the cowards who took no stand in conflicts between good and evil--Heaven doesn't want them, and Hell refuses to accept them into its realm proper. After crossing the river Acheron, they enter Limbo, the realm of the noble or innocent souls who were not baptized or otherwise not believers in the Christian faith. There, Dante meets Homer and the other great poets of antiquity, and they and Virgil recognize Dante as among their number before he and Virgil set off to explore the depths of Hell. And so much more sorrow, spurring greater woe. There was the horror of Minos standing there, snarling. Judging those in his grip and sentencing them accordingly. Comes before him, it confesses all. As levels down he wishes that soul put. Each one in turn goes to judgment. They speak and listen and are then sent down. “Watch how you enter and in whom you trust. And my master said to him, “Why do you also squawk? Do not impede his destined journey. The place where so much weeping flails upon me. As if from the battling of opposing winds. Whirling and pummeling, it torments them. There they curse the Virtue Divine. Those whose reason succumbed to their drives. So were the sinful spirits blown about. They are driven from here, from there, downward, upward. Not of being allowed down, nor of lesser sentence. “Was empress of many tongues. In order to displace the guilt into which she had been led. Succeeded Ninus and was his wife. She held the land the Sultan rules. And broke faith with the ashes of Sychæus. And then there is lustful Cleopatra. Who, at the end, battled with love. Those whom love had parted from our life. Pity befell me, and I was almost lost. So strong was my tender cry. For you took pity on our vile depravity. While the wind, like it is now, is silent. In order to make peace with its followers. From which I was torn, in a manner that still brings me to anger. That, as you see, I still am not abandoned. These words they conveyed to us. I then turned to them and spoke. Fill me with such sadness and pity that I am moved to tears. In misery—this your Teacher knows. I will tell of it, though as one who speaks through sobs. Of Lancelot and how Love compelled him. We were alone and suspected nothing. While reading, and our faces paled. But only one moment overwhelmed us. Kissed my mouth, trembling all over. That day we read no further. I swooned as if I was dying. And I fell like a dead body falls.